George CRUMB: “70th Birthday Album.” Star-child; Mundus Canis; Three Early Songs. Bridge 9095. http://www.bridgerecords.com/. I was way pleased when the Grammys gave George Crumb’s Star-child the honors for Best Contemporary Composition of 2000. Don’t get me started on 2001’s Pulitzer. You need to realize that in the Pulitzer’s music category, the winner is chosen from works that are submitted to the Pulitzer Committee. George Crumb appears as a performer in three complementary works of different moods. He’s the percussionist behind David Starobin on guitar in Mundus Canis, five short and elegant works celebrating five different dogs of the Crumb household. 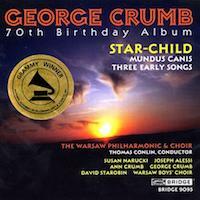 Crumb plays the piano with his daughter Ann in Three Early Songs, straightforward and genial music, and Crumb is a bell ringer in the big prizewinning piece on this disc, Star-child. Star-child is a major work for orchestra, soprano, solo trombone, children’s voices, male speaking chorus, and bells. Though it got an award in 2000, it actually was written in 1977. Over a gently moving string ensemble texture recalling Ives’ The Unanswered Question, Crumb places trombone and soprano in different tempos with vastly different music. Crumb’s pivotal Ancient Voices of Children is perhaps his most influential and well-known work, music that is somewhat different than the works on this Bridge disc. Mundus Canis comes close because of it’s delicacy and slight oddness. The only recording of Ancient Voices of Children to consider is Nonesuch 9 79149-2. A relatively recent disc with a strong marketing force behind it is the Kronos Quartet’s Black Angels disc (Nonesuch 9 79242-2) containing Crumb’s string quartet of the same name, an obvious work for the Kronos to get into as it’s for amplified string quartet with all sorts of extraneous noises, including speech, water glasses, etc. Idle Chatter Junior continues and culminates a long series of electroacoustic pieces in which Lansky explores human speech. It is a world, to paraphrase Lansky’s own words, where speech is transformed into percussion music. Syllables and snippets are taken from human speech and strung together to create a diaphanous texture that Lansky rightfully calls “chatter.” This chatter is supposed to be unintelligible, but occasionally yields something recognizable. Lansky’s blends the chatter with an additional layer of pitches. These pitches relate to pitches that come before and after, consequently adding harmonic motion to the work. I find this aspect of the work distracting because it’s a fairly tempered set of pitches (the pitches fall into the notes of our standard tuning system). I also find Lansky’s rhythmic schemes distracting too, and I end up focussing upon the accompanying beat patterns instead of the chatter. Ok, maybe it’s my problem. Looking back at precursors to Idle Chatter Junior (Bridge 9050 has Idle Chatter, just_more_idle_chatter, and Notjustmoreidlechatter, and you can go even further back to the Smalltalk series that began on New Albion NA030CD) reveals Lansky’s fascination with details and puts this work and so much of what Lansky likes to do in the context of a continual set variations on the voice and computer. Now, have you ever vacuumed while the radio was still on? The loud hum of the vacuum obscures and emphasizes pitches and chords, creating disassociated textures, sometimes musical, above a dense drone. In some computer music, filtering works just like the effect of the vacuum. Techniques that mix the filter/vacuum effect and the speech becoming percussion effect are evident throughout the disc’s title piece, Ride, whose program note completes what would otherwise be a difficult sound world to decode. The whooshing of textures and pitches which are derived from the sounds of passing cars would be difficult to decode otherwise (for some reason I think the cars were recorded while it was raining). Moments in Ride convey that rare experience of driving by a festive fairground or the dinky synthesized melody some church towers now have. Let me mention a few specific works on the disc: In Looking Back, Lansky has sung the big chorale theme of Brahms’s First Symphony, the tune of his high school song, but has layered and processed it into a short bittersweet memento of Lansky’s high school years. Heavy Set revels in the machinations of a computerized, but one-handed pianist. Dancetracks: Remix is the work I find the most fun. Lansky has taken a recording made by guitar friend of one of his works and recomposed it. I guess I like the variation aspect of this work the most, the fact that this work is continuously changing both the core sound of the guitar as well as the accompaniment. Years ago, I felt that Lansky was too close to his material and his tool box to be able to give us something for the rest of us to understand. To a lesser degree I still think this is true, but improvements in technology give today’s electroacoustic and computer music composers more chances to follow paths that lead to dead ends and more time to reflect upon what they have wrought. But creating this type of music today now takes less time, except now that there is more time to do more complex things. The best thing is that Lansky’s electroacoustic music is personal, whether it uses or mimics sounds created by real people. It’s also about one person having fun pulling the world into the studio and creating something fresh for the concert hall or CD player, and often taking that result back into the studio for one more go at it. Salvatore SCIARRINO: Complete Piano Works. Massimiliano Damerini (piano). Dynamic S 2015. http://www.dynamic.it/. Distributed in the US by Qualiton: http://www.qualiton.com/. This was on my must have list and was definitely worth the wait. Sciarrino is a contemporary Italian composer that you should get to know. Born in 1947, he’s seen the onslaught and retreat of serialism in Italy, and has created a diverse body of works, large and miniature. The disc is titled “Complete Piano Works (1969-1992),” and it is top heavy, leading off with all four of Sciarrino’s piano sonatas. These sonatas are bold extroverted works that acknowledge trends in compositional philosophies with a little nose-thumbing for good measure. I haven’t seen scores to be completely sure, but I sense that the first sonata of 1976, perhaps also the second (1983), flirts with aleatoric notation if not graphic notation. For contrast, I thought immediately of Boulez’s sonatas (take Claude Helffer on Naïve 782-120), though Boulez is of an earlier generation (Boulez No. 1 is contemporaneous with Sciarrino’s birth.). If you take the Boulez or Sciarrino sonatas in sequence in one sitting, you can hear the passage of time. I also thought of Ustvolskaya’s piano sonatas which are also listenable in sequence in one sitting, but you wont hear development from one to the next, or sense that the composer is concerned with ongoing compositional philosophies (Frank Denyer on Conifer 75606 51262 2 is the recording I’ve heard). Sciarrino likes to use all of the piano’s 88 keys in a consistent and virtuosic manner. Sometimes it even sounds as if he is trying to use all 88 at once. These are incredibly extroverted works, bordering on the manic. Massimiliano Damerini is supremely up to the task. Three of the four sonatas were written for him, and it’s clear that he brings years of experience and familiarity with Sciarrino to the task. It is a riveting experience to listening to all four sonatas sequentially, and unlike the Boulez or the Ustvolskaya series, you will need a towel afterwards. With strident clusters and arpeggios, Sonata No. 1 rushes by like a nightmare. The force of the Fourth Sonata’s nearly 9 minutes of alternating clusters at the extreme ends of the piano with rolled notes in contrary motion is perhaps the most taxing piano work I can think of, more so than Xenakis’ Herma. This type of music might sound worthy only of a footnote (who really programs Alkan or Sorabji? ), but it’s colorful and there is much more going on in it than just brute pianism. Shorter more delicate works and miniatures complete the disc, works which by comparison are reflective and coy. Sciarinno’s spins out a few minutes a la Ravel in De la nuit exploring a ravishing and glittery style which appears more brutally in the sonatas. Damerini also plays Perduto in una città d’acque on col legno WWE 2CD 20055 which documents the Darmstadt Summer Music School of 1998. On that disk, the work was disappointing to me as I could not put it in context. The delicate trifle with a simple melody framed by gentle arabesques documenting Luigi Nono’s passing, did not fit with other Sciarrino works I had heard and seemed macabre and irreverent. But in context of Sciarrino’s sonatas I definitely get it now. More Sciarrino? Why not! Roberto Fabbriciani is one of the more avant-garde flutists out there. He plays in three Sciarrino works on an old BMG Ricordi disc (CRMCD 1029). The longest at nearly forty minutes, La Perfezione di uno Spirito Sottile adds voice and does take some endurance to listen to, especially the sections of overblown notes on the harmonic series which sound a bit like a squeaky carousel. And by the way it’s dedicated to Nono. Two other two much shorter works, Il Motivo degli Oggetti di Vetro and Addio Case del Vento echo the balance of Sciarrino’s output. A tiny piece full of breath noises and key slaps is Quintettinno No. 2 on a BMG Ricordi disc (CRMCD 1010) featuring the Quintetto Arnold playing contemporary Italian wind quintets. More recent discs include the Ardittis playing the wispy Sei quartetti brevi on the two disc Montaigne set of Italian string quartets (MO 782042) and Vagabonde blu with the accordionist Teodoro Anzellotti on hat[now]ART 131. The Anzellotti disc is full of remarkable redefining works for accordion, Sciarrino’s contribution is alternately breathy and piercing in the same vein as Quintettinno No. 2. Ustvolskaya’s Symphony No. 3 is an odd one (I’m spelling her name in an Americanized way, though the CD uses Germanized Russian). Ascetic and terse, it’s a very compact statement of belief for a strange collection of instruments: 5 oboes, 5 trumpets, 1 trombone, 3 tubas, 2 bass drums, tenor drum, piano, 5 double basses, and speaker. It is a very self sufficient work, slow and somber that warrants another listen. Rihm’s Music for Clarinet and Orchestra is one of Rihm’s larger and slower works, featuring a clarinet line that weaves from one extreme register to another through slow sustained notes while the orchestra plays a supporting rôle . It’s well done and harmless, and continues to convince me that I’m missing something about Rihm. The Rihm is polished, professional and a consistent statement, but compared to the Ustvolskaya Symphony, I’m not as convinced by it. Zimmermann’s Photoptosis is the oldest work on the disc, and representative of Zimmermann’s “pluralistic” or collage style. Coming at the end of Zimmermann’s life, Photoptosis is simultaneous with the ambitious Requiem for a Young Poet. Subtitled a prelude, this work can be described as a fatalistic crescendo with a strange interruption. The interruption grabs material from other music, lurching forward with a potent quote from the fourth movement of Beethoven’s ninth (the orchestral tutti just before the bass soloist comes in) and goes on to ransack some Bach, Wagner, and Tchiakovsky. Zimmermann does this sort of thing better than anybody else, and the quotes are woven into the dark texture in such a way that it’s possible to miss their explicit passing. The pluralistic experience in Zimmermann is sensed more than actually heard, suddenly we’re aware of something oddly familiar in the music. Berio’s riff on Mahler and music history in Sinfonia is fun and naïve by comparison. This Zimmermann work is full of such startling menace that you’ll be relieved when it’s over. The CD has 03 in big type all over because it’s the third volume of a series celebrating the Symphonieorchester des Bayerischen Rundfunks and the Munich based musica viva festivals. Volume 1 has Feldman’s Neither (col legno CD WWE 20081), Volume two is a handful of world premiere recordings by Isabel Mundry, Jörg Birkenkötter, Henry Koch, and Olga Neuwirth (col legno CD WWE 20082). Volume 4 has two CDs with Boulez conducting Debussy’s Le Martyre de Saint Sébastien, Stravinsky’s The Flood, the 14th century anonymous Messe de Tournai, Messiaen’s Oiseaux Exotiques, and Bartok’s Cantata Profana (col legno CD WWE 20084). Volume 5 is a single disc with Maderna conducting Niccolò Castiglioni’s Aprèslude, Ravel’s Histoires naturelles, Ligeti’s Apparations, Schönberg’s Kammersinfonie op.9b, and Tadeusz Baird’s Espressioni varianti (col legno CD WWE 20085). Some composers seem destined for miniatures or simple set pieces, but László Melis is destined for epics. The two works on this disc are short (Mulomedicina Chironis is just under 16 minutes, and The Apocalypse of Enoch is 42-1/2 minutes), but they are multi-movement works where the progression of material and text make it clear that we are to be changed by the experience of listening and understanding the texts. Melis’s vocabulary is straightforward: his melodies, setting of text and use of modes is close to the minimalism of Steve Reich (whose music he has played), but the gravity of his music brings him closer to Louis Andriessen (another whose music he has played). I can’t help hearing similarities with the music of Michael Torke, but that’s mostly because of the modal similarities. The ensembles of each of these works are essentially small chamber ensembles of wind quartet plus string quintet with added keyboard (piano or organ), maybe a harp, percussion, and with two solo voices to carry the words. Mulomedicina Chironis creates a curious cantata from four apparently unrelated texts: a Latin translation of a passage from a Greek veterinary text on healing mules (hence the title), two lines from Marlowe’s Doctor Faustus, Baudelaire’s dying words, and a poem by Petri about Hölderlin. The Apocalypse of Enoch draws upon the Book of Isiah, the Apocalypse of Enoch, and short texts by János Pilinszky and Béla Hamvas to create a longer, more somber work. The last movement, for voice over lone drum beats, is rather brilliant, a seemingly simple vocal melody that gradually rises and ends completely unexpectedly. You will play the last movement again because you will miss the ending. Melis definitely has a distinct and engaging style. A cynic could say that this music is derivative of Reich’s Tehillim, but Melis’s sense of balance and proportion is more mature and reasonable. Melis favors short and varied movements, and his orchestration and instrumental colors are constantly shifting and changing. The music is delicate and sensitive, despite some contrasting and necessary strident percussion passages, and these are definitely the compositions of a seasoned performer and musician. The performances are first rate and are well balanced on the recording. This disc is a sure find for anyone who craves interesting and considerate settings of texts, and Melis’s style should appeal regardless of a listener’s attitude towards minimalism. In the last issue (Volume 3, Number 4), W.A. Grieve-Smith wrote on recordings of Bach’s Art of Fugue, most executed on organ. Even though the Art of Fugue is a masterpiece, I find it very, very difficult to sit through nearly 90 minutes of dense and exemplary counterpoint in d minor. (In college, I squirmed through a performance of the work for piano. Without a score to occupy me, I imagined dismantling the piano while the pianist was playing upon it. This is a rather effective strategy I often employ so as not to disrupt other concert goers.) The best way to come to grips with the Art of Fugue is probably by picking through a contrapunctus on one’s own . I won’t go into whether your personal copy should be open score or conventionally notated for keyboard. I’ve always preferred performances of the Art of Fugue where each voice is presented as a clear line, and this is probably why I prefer unconventional recordings (because the piano has a pedal which is often used inappropriately to blur the lines is yet another reason). There are but three recordings of the Art of Fugue in my collection. The equally loved and despised version by the Juilliard String Quartet who employ a special viola to reach low notes (Sony S2K 45937 with Robert Mann, Joel Smirnoff, Samuel Rhodes, and Joel Krosnick), a wonderful version for saxophone quartet with the acrobatic Berliner Saxophon Quartett (cpo 999 058-2), and this somewhat recent version for full orchestra orchestrated and conducted by Erich Bergel. Bergel’s orchestration is fairly conservative giving the strings the most prominence in the voices, using the winds and brass for support. It’s not the klangfarbenmelodie Webern used in his orchestration of the Ricercare from the Musical Offering, which might be curious for one fugue but for the whole set probably bizarre, and it’s not like any of the lush and slightly showy Stokowski-Bach orchestrations. Most of the orchestrated lines are somewhat predetermined by their ranges, consequently there is much to do for the low brass and bassoons. The work was recorded live at a public concert in 1991 in the Synagogue of Dohány utca in Budapest. There is a magisterial richness to the sound, and almost a minute of applause at the end of the last and towering fugue. Everybody has probably heard the story attested to by C.P.E. Bach, that Bach left the last fugue incomplete and died while writing it just after he introduced the B-A-C-H motive into the music (in German musical spelling, B is b-flat and H is b-natural). I recall more than one keyboard performance where only Bach’s notes are worthy of performance, and so the fugue trails off abruptly, the dense tapestry of counterpoint reduced suddenly to a single unresolved voice. This is an action which makes you realize you’re listing to a performance and not just music. Bergel has completed the last contrapunctus and this last fugue is this performance’s climax. Probably intended to be a quadruple fugue, this last fugue is the longest (there are four subjects or themes, each is developed into a fugue on its own and then combined with the previously introduced subjects). It is just 14 minutes on this recording, roughly four times longer than most of the other fugues and canons in the set. Bergel is on his own after the eight minute mark: he completes the third section where B-A-C-H appears, and for the fourth section, he reprises the opening bars of Contrapunctus I bringing in each of the other subjects for a bit before wrapping the whole thing up. Bergel doesn’t extemporize more than he has to, and, the truth is–though I haven’t work it out here for myself — that the voices in Bach’s fugues tend to work together only in a fixed number of ways. Bergel’s presence is thusly very modest and allows Bach’s music to stand on its own and be heard. Let’s face it: I’m probably the least likely one here at La Folia to write a few sentences about a disc of British music for violin and piano, but this disc was a happy surprise in my mailbox. Peter Sheppard Skærved plays with lots of control and color, and very expressively too. These works aren’t standards, but they’re played like they should be. There are so few duos for two violin which are actually performable in concert (most are pedagogical works) and Rawsthorne’s Theme and Variations should take a place alongside Berio’s and Bartok’s. György KURTÁG: Grabstein für Stephan, Op. 15c; Stele, Op. 33. Karlheinz STOCKHAUSEN: Gruppen. Berlin Philharmonic, Claudio Abbado. DG 447 761-2. Some time ago, I wrote about Stockhausen and mentioned a disc hard to find in the US. I finally saw it and paid the extra “import” bounty even though it’s not even 45 minutes of music.But file this under Kurtág and not under Stockhausen. I cannot get into Gruppen despite pulling a few reference books off shelves to get into the context of the work. For a large orchestra and three conductors, Gruppen strikes me as random and chaotic. Maybe reading about the work makes it more impenetrable. Maybe I prefer Cage’s brand of seeming randomness. Maybe I like music which is aware of the existence of beauty, even if beauty is hidden in another room. , Op. 27 and Scenes from a Novel, Op. 19. The Sony disc has Peter Eötvös conducting the Ensemble Modern. Kurtág writing for large forces and standard orchestra might seem uncharacteristic, but his handling of texture and balance is very, very expert and nuanced. While Stockhausen’s Gruppen sounds like disjunct gestures being flung out into space without regard for how they will land or relate to one another (even if that’s the point of the work, I still find it unfulfilling), Kurtág is incredibly sensitive to how everything relates to what has come before. Stele opens with the orchestra playing the note G distributed through several octaves in an orchestration which made me instantly recall Beethoven. Microtonal sighing dissipates the G’s and Kurtág builds up several dense climaxes. The last movement has a rather extraordinary shimmering effect emphasized by with flutes, strings and cimbalom. So, though I initially mentioned this disc in context of Stockhausen, I’d recommend it for the Kurtág. Next time: Xenakis and his legacy (a book, a great two CD set from Mode, and a CD reissue from Erato), and a marvelous pile of electroacoustic stuff including discs from EMF, Centaur, and one of the labels I’d like to own everything they’ve ever put out, the Canadian empreintes DIGITALes.